Johann Hallim had mentioned dining in Ossington Village (Dundas/Ossington) a few days ago, and mentioned that his cousin’s favourite restaurant in Toronto, Foxley Bistro, was also in this area. Apparently random girls will decide to sneak in and pose in your photos of the restaurant. 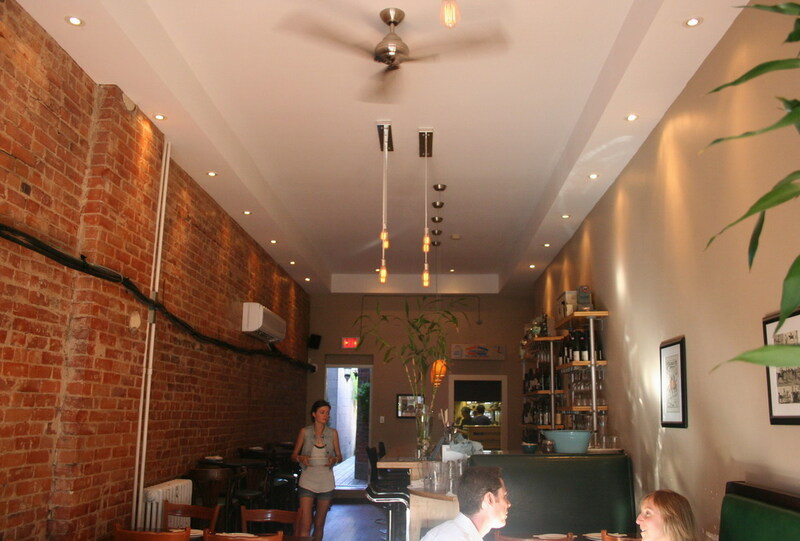 The restaurant serves asian-inspired tapas. The interior is cool, with a back patio for the warmer summer days. Blue Crab and Avocado Salad ($10?) – All the reviews seemed to point this out as a must-have item, and deservedly so. 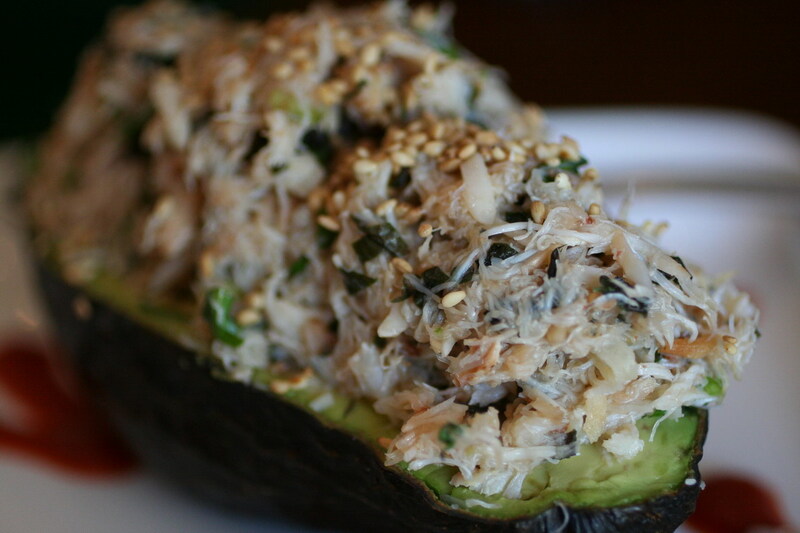 Mounds of sweet blue crab, piled atop an avocado, with a bit of sriracha on the plate for optional seasoning. Great fresh ingredients, simple, and great as an opening dish. Sea Bream Ceviche with Yuzu and Shiso Leaf ($15). 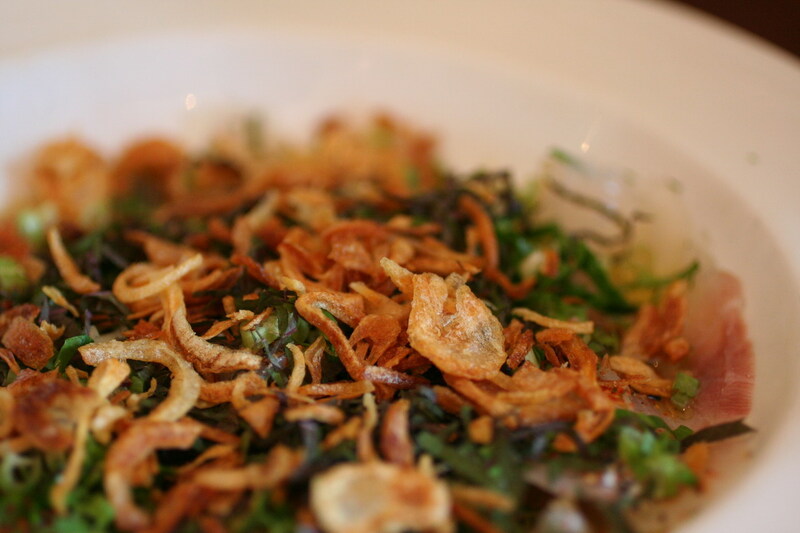 The thin sea bream filets are under a layer of shredded shiso, another shredded herb, and garlic chips, in a puddle of yuzu vinaigrette. Shiso is a fragrant japanese/korean herb, almost perfume-like in aroma at times. These were actually far more mild, so that they wouldn’t overpower the other ingredients. The balance between the yuzu tartness, the sweet and crunchy garlic, lightly herbal and fragrant shiso, along with the lightness of the sea bream was just perfect. 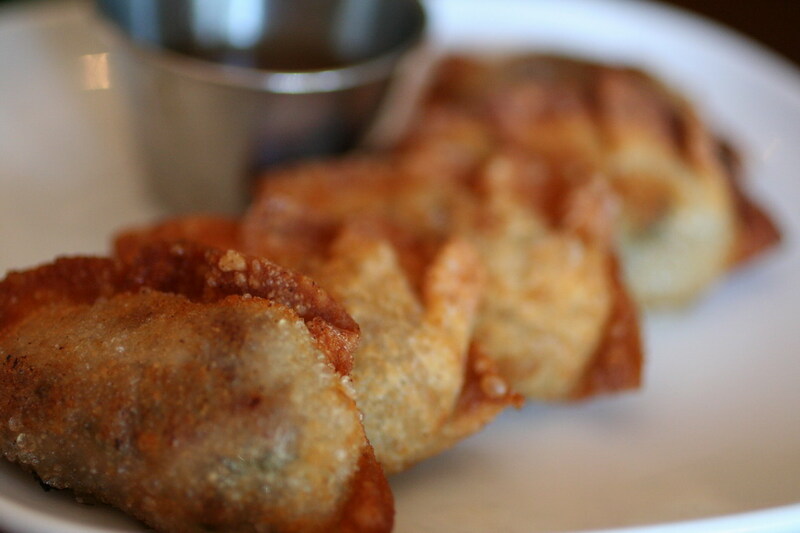 Lamb and Duck Proscuitto Dumplings ($7), fried crunchy and sealing the meat juices inside. The flavours were melded together too much, and there wasn’t enough seasoning or textures inside — it was just mixed ground meat. That being said, it wasn’t prominently gamey, either. Not sure I would order this again. Grilled side-ribs with caramelized shallot glaze ($9), was also mentioned frequently in reviews. Some of the meat closer to the bone was very tender, but some chunks of meat were also a bit dried and tough. 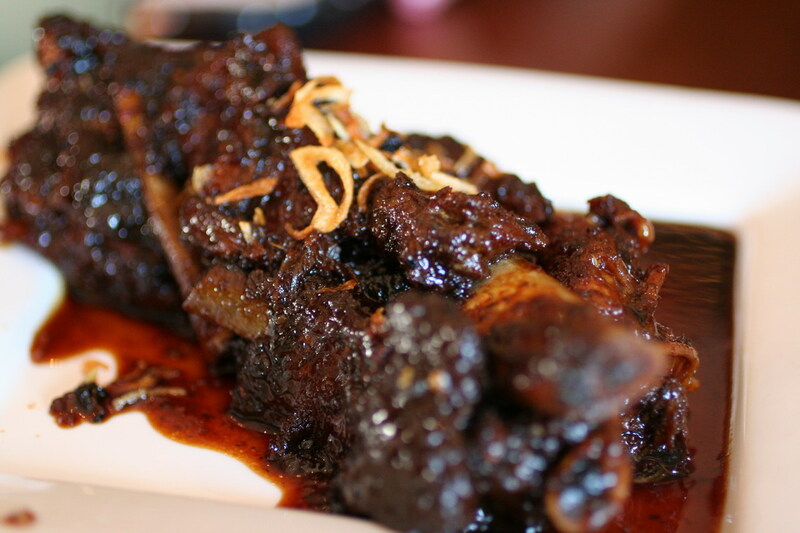 It felt like they may have slow-grilled the meat, before simmering it in sauce. The sauce was very nicely reduced, and it was mildly sweet, with light vinegar and ginger flavours. J said it tasted a lot like 糖醋排骨 that her mom made. Also not sure I would order this again, though it was interesting to try for the first time. that Blue Crab and Avocado Salad looks really good. I assume it is served cold. the creaminess of the ripe avocado i would imagine to lift the sweetness of the crab? Yep it was served cold, but it was actually the bit of tartness from the sriracha’s that brought out the sweetness of the crab. and i suppose that same acidity also helped balance the creaminess of the avocado.